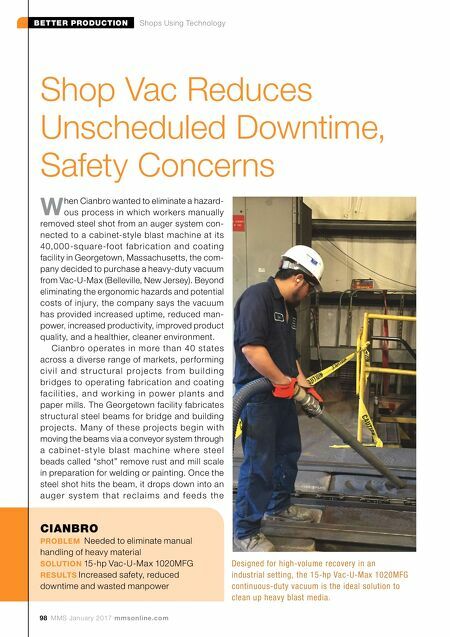 98 MMS January 2017 mmsonline.com BETTER PRODUCTION Shops Using Technology CIANBRO PROBLEM Needed to eliminate manual handling of heavy material SOLUTION 15-hp Vac-U-Max 1020MFG RESULTS Increased safety, reduced downtime and wasted manpower Shop Vac Reduces Unscheduled Downtime, Safety Concerns W hen Cianbro wanted to eliminate a hazard- ous process in which workers manually removed steel shot from an auger system con- nected to a cabinet-style blast machine at its 40,0 0 0 -square -foot fabr ic ation and coating facility in Georgetown, Massachusetts, the com- pany decided to purchase a heavy-duty vacuum from Vac-U-Max (Belleville, New Jersey). Beyond eliminating the ergonomic hazards and potential costs of injur y, the company says the vacuum has provided increased uptime, reduced man- power, increased productivity, improved product quality, and a healthier, cleaner environment. 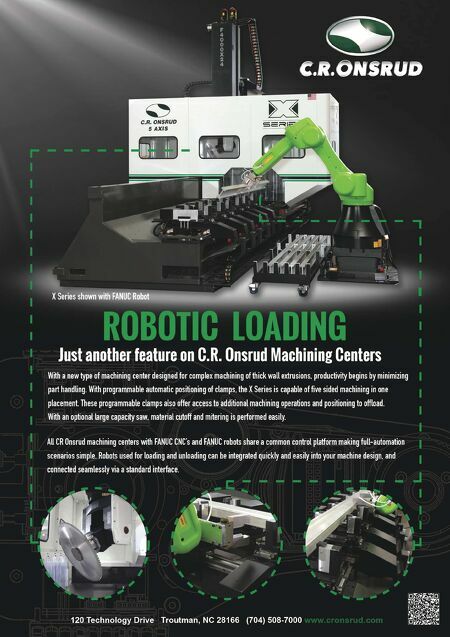 Cia nbro ope rate s in more tha n 40 state s across a diverse range of markets, performing c i v i l a n d s t r u c t u r a l p r o j e c t s f r o m b u i l d i n g bridges to operating fabrication and coating f a c i l i ti e s, a n d wo r k i n g i n p owe r p l a nts a n d paper mills. The Georgetown facility fabricates structural steel beams for bridge and building proje cts. Many of the se proje cts be gin with moving the beams via a conveyor system through a c a b i n e t- s t y l e b l a s t m a c h i n e w h e r e s te e l beads called "shot" remove rust and mill scale in preparation for welding or painting. Once the steel shot hits the beam, it drops down into an a u g e r s y s te m t h a t r e c l a i m s a n d f e e d s t h e Designed for high-volume recovery in an industrial setting, the 15-hp Vac-U-Max 1020MFG continuous-duty vacuum is the ideal solution to clean up heavy blast media.